Through our work with nonprofit organizations, grantmakers, movement networks and other partners in the field, we have had the opportunity to work collaboratively with people deeply engaged in these efforts toward positive change. Through these partnerships, we are getting increasingly clear that both deep and wide-scale change is found in the interconnected practices that weave together a set of five elements. Continuous and synchronous attention to these elements is foundational to being in “right relationship” with change—to advancing transformation toward love, dignity and justice. Join MAG as a Board Member or Experimentation Partner! We are seeking curious and imaginative colleagues to join us in living into a new and yet-to-be-imagined form of nonprofit governance. This piece is a follow-up to a recent webinar on systems change and equity developed by the Building Movement Project and Management Assistance Group and cross-posted on Building Movement Project’s blog. Today, in a time of heightened attention to racism, xenophobia, police brutality, sexual harassment, gun violence, Islamophobia, climate change, and more, there is an urgency and commitment to stretch the bounds of what is possible and to move from merely improving systems to disrupting and transforming systems. And yet, dominant approaches to systems change fail to integrate an intentional racial equity lens into the work. Without a focus on racial equity, how we bound the system -- and influence the structures, people, and invisible fabric that connects these elements within the system -- is susceptible to unnamed racial (and/or other forms of) bias and assumptions. We might also ignore the historic context that shaped the system and pursue change efforts that don’t address the unseen patterns of white dominant culture upholding the system. These are just a few of the ways that systems change without an equity lens falls short. What does transformative systems change look like in the field? Where are we seeing real shifts in power and lasting transformation? What is different about the approaches led by people of color, women, immigrants and others groups who are leading this work and often on the periphery of dominant narratives about systems change? These initial conversations brought into focus how systems change with a equity lens differs from a conventional approach by explicitly addressing how white supremacy and patriarchy sustain unhealthy systems. Grounded in shared humanity. The systems change effort is aligned around a clear vision for change that recognizes the unique and individual needs of everyone in the system. The effort seeks to repair, restore, and lift up relationships and connections across people and communities to support shared stewardship for change. Reinforces and resources decisions made by communities affected by injustice. The systems change effort redistributes and rebalances power. Communities are a part of meaning-making and decision-making rather than simply informed. This includes providing communities with the funding, training and information needed to make decisions that serve them. 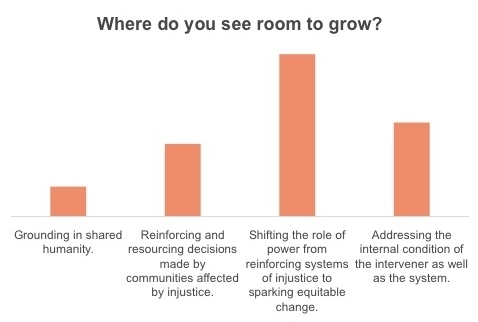 Shifts the role of power from reinforcing systems of injustice to sparking equitable change. The approach is grounded in an understanding of how white supremacy and patriarchy have shaped systems and structures to perpetuate inequity. The strategy assesses who/what has power and how we build, redistribute and share power to transform systems and prevent systems from resetting back to the status quo. Addresses the internal condition of the intervener as well as the system. Effective systems change requires the intervener to look inward and tend to the inner health of the change effort in order to effectively spur change. The systems change effort seeks to alter the dominant and oppressive narratives we tell ourselves and supports people in being grounded and in touch with their emotions so that they can be in relation with one another. We further explored these components and systems change with an equity lens in a 90-minute webinar (see recording below). Over 700 nonprofit leaders, funders, conveners, and capacity builders from across the justice ecosystem registered for the webinar. Guest speakers, Reverend Joan C. Ross of the North End Woodward Community Coalition and Lauren Padilla-Valverde, Senior Program Manager at the California Endowment, shared their experiences as practitioners advancing complex systems change that centers racial equity. Reverend Ross described her work to secure a community-led radio station (WNUC) in Detroit in order shift systems of communication and the demographics of who has ownership over community narratives in Detroit. Prior to this work, structural barriers kept young black community members from sharing their stories beyond their immediate community and shaping narratives about their city. Lauren shared her work as part of the California Endowment’s Building Healthy Communities Initiative: Towards a Racially Equitable Monterey County. The Endowment’s work in Monterey County uses healing-informed practice to support systemic equity in the City of Salinas and brings together government, philanthropy, business, and community members to co-create joint processes for systemic change. This webinar was just one step in continuing to build our understanding of the intersection of equity and systems change. Webinar participants indicated an interest in continuing the conversation, and MAG and BMP are exploring the possibility of bringing together a community of practice, writing additional blog posts on the great questions raised in the webinar, and creating further case studies on the stories shared within the next few months. More to come soon! Click here to download the webinar slides and watch the recording. *Special thanks to: Helen S. Kim; sujin lee, Independent Coach and Consultant; Steve Lew, Senior Project Director, CompassPoint; Melanie Mitros, PhD; Director, Strategic Community Partnerships, Vitalyst Health; Darlene Nipper, CEO, Rockwood Leadership Institute; and to the many others who contributed their thoughts to the development of this framework. Where in the country are immigrants being best served by the workforce development system? What conditions give rise to these bright spots and enable greater collaboration across immigration and workforce development sectors? Read more about the 5 elements MAG believes are critical to creating a thriving justice ecosystem.